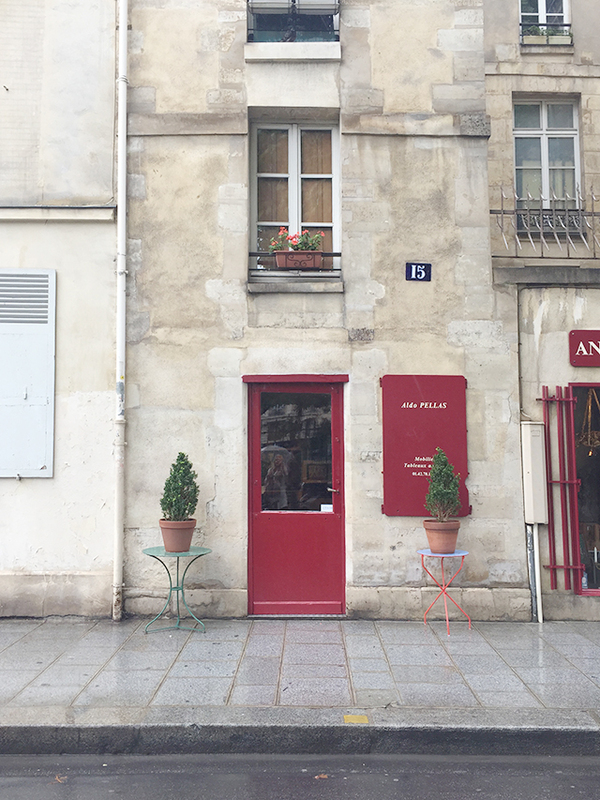 We just got home from our Paris adventure and I’m so excited to share more photos with you all! It was pouring rain for most of our visit, but we brought umbrellas and weren’t going to let a little rain stop us. C’est la vie! 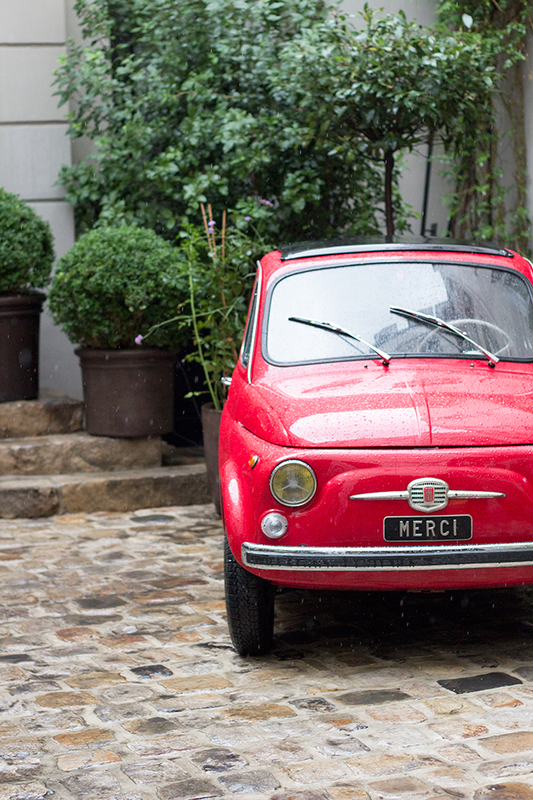 On our second day in Paris, we took the metro to Merci (an adorable concept store famous for the little red car parked in their courtyard). After browsing through the store and taking our fair share of photos, we decided to walk to L’as du falafel (an extremely popular Israeli restaurant that totally lives up to the hype) for lunch. Even in the rain, it was an absolutely lovely walk. 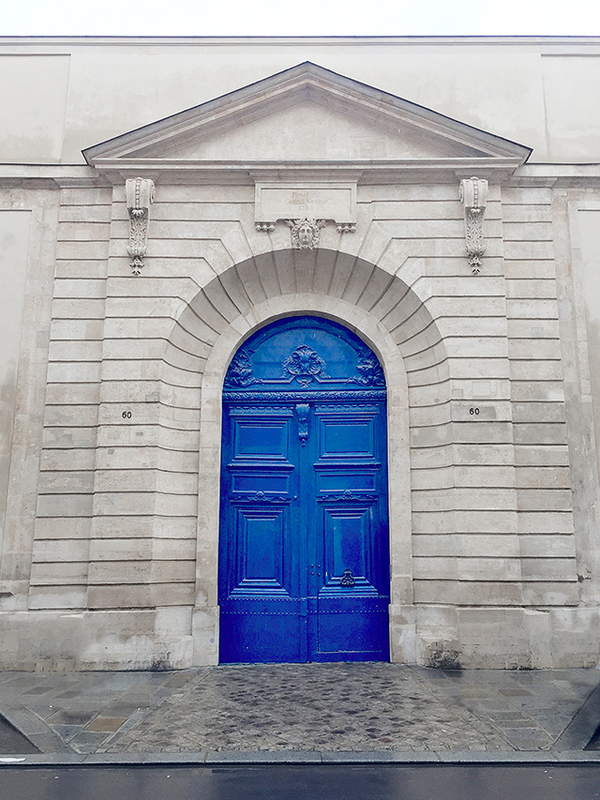 I just couldn’t resist stopping every block or so to take photos of gorgeous Parisian doors. On our way to lunch, we stumbled upon this hidden little courtyard. The architecture of the buildings surrounding it was stunning so we just had to stop & take some photos! Everywhere we went in Paris we either took the Metro or walked, so wearing lots of layers was crucial. While it was chilly & raining outside, the crowded metro was very very warm. I’m glad I brought my blanket scarf along, because it was absolutely perfect for throwing on & taking off as the temperature changed. Also, there is something just so irresistibly cozy about wrapping yourself in a plush oversized blanket on a rainy day! I love collaborating with fellow women entrepreneurs… power to all the #girlbosses reading! So today I’m teaming up with Mandy from Zyania (the owner of the online accessories shop where I got my blanket scarf!) to give you guys a little gift! One lucky reader will get their own blanket scarf to cuddle up in this fall! The giveaway is being hosted on my Instagram this time around, so hurry on over if you want to win your own perfectly plaid fall accessory! Rompers & Booties for Fall!